More Optometrists Find Jobs On Local Eye Site Than Anywhere Else. 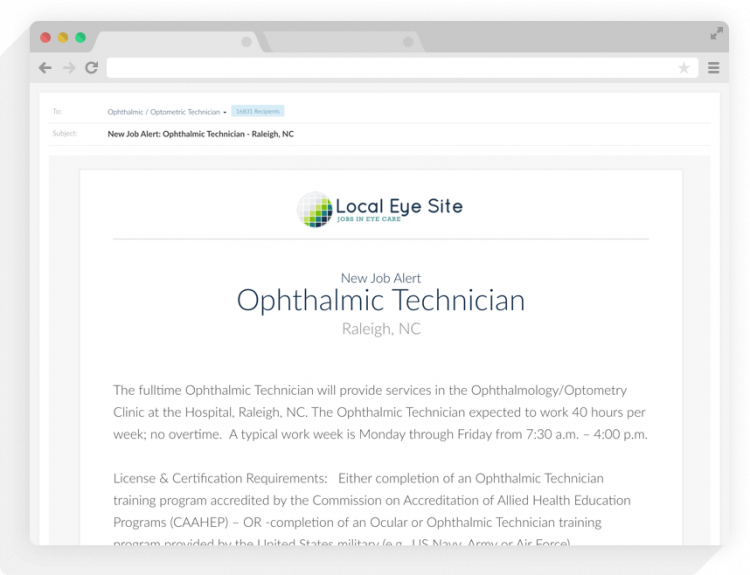 Our smart job-distribution technology targets ODs and Optometrist jobseekers online, and promotes your job listing across the web and to the most important Optometry websites all at once, at no additional cost or effort on your part. Every job listing on Local Eye Site is promoted through our exclusive network of the best-known Eye Care websites, publications, and associations. Our smart job-distribution technology targets Optometrist jobseekers online to deliver a higher percentage of qualified candidates. With our ‘Connect2Hire’ jobseeker email blast, you can send your job listing directly to thousands of candidates in our database with just one click. Reach the best candidates even when they’re not actively searching. Sending 1 Connect2Hire with your job ad can generate twice as many applicants as a job listing alone. 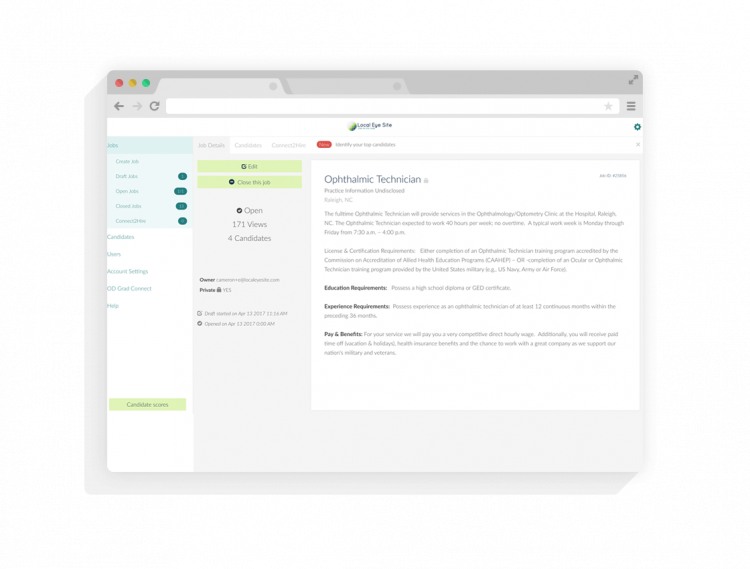 With your Local Eye Site account, you’ll have a hiring dashboard that keeps all of your candidate information and files organized in one place. No more dealing with emailed applications and attachments. All of your history is also saved so you can quickly create a new job ad or reference a previous candidate the next time you need to hire. Would you like a premium level of service that goes beyond our basic job listing functionality? 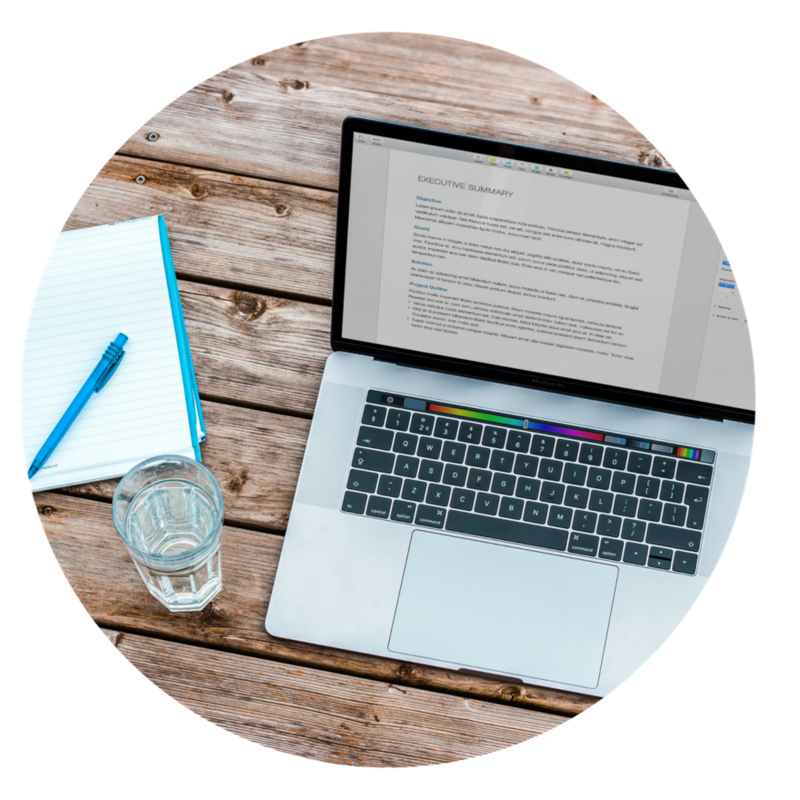 With LES Recruiting Services, our team handles everything including creating your job advertisement, promoting your position, and reviewing candidates.